In this study, we developed a simple instrumentation for electrical impedance tomography (EIT). In general, EIT systems have the following components: a system with electrodes, a current source and a current drive and voltage measurement system. In this work, we utilized a cylindrical container with six rectangular electrodes, a resistor-based current source and an Arduino micro-controller for the drive and measurement system. EIT experiments were done on a dalandan and angular analysis was performed to investigate and quantify the accuracy of the image reconstructions via image processing techniques. The results show a deviance of 0.15 radians between the real and reconstructed images. This relatively small error indicates the good accuracy of the EIT system in reconstructing the object. D. B. Lao and G. Tapang. 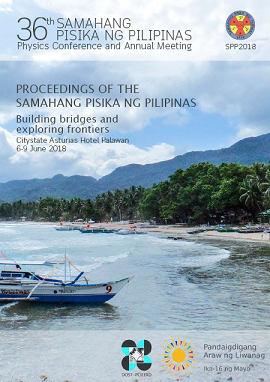 Developing an electrical impedance tomographic system, Proceedings of the Samahang Pisika ng Pilipinas 36, SPP-2018-PC-23 (2018). URL: https://paperview.spp-online.org/proceedings/article/view/SPP-2018-PC-23.